Canada has refused to back down from its human rights stance despite Saudi Arabia’s expulsion of its ambassador. 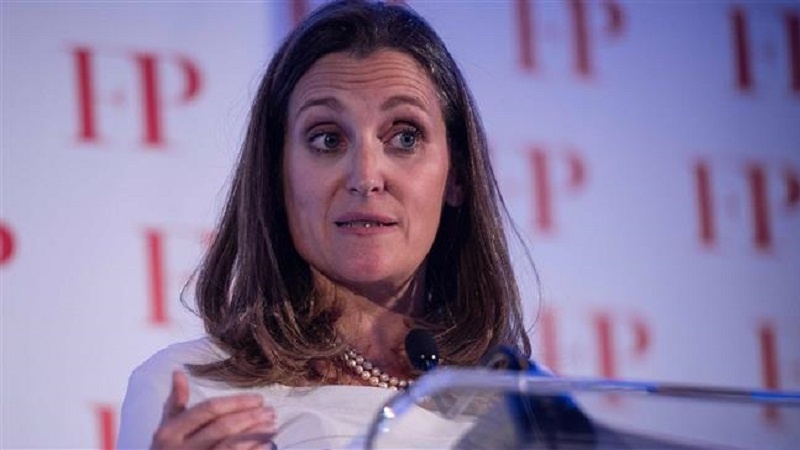 Earlier in the day, Freeland’s spokeswoman said that the minister is “seriously concerned” over Saudi Arabia’s actions. “Canada will always stand up for the protection of human rights, very much including women’s rights, and freedom of expression around the world,” she said. “Our government will never hesitate to promote these values and believes that this dialogue is critical to international diplomacy,” she added. On Monday, Saudi state airline Saudia announced that it will start to suspended flights to and from Toronto as part of its freeze of ties with Canada. On Sunday, Saudi Arabia has expelled the Canadian ambassador and recalled its envoy after severing business ties with Ottawa over claims of interference in its internal affairs. The announcement was made after, the Canadian Embassy in Riyadh said it was “gravely concerned” over a spike of arrests of human rights campaigners in the Saudi kingdom including gender rights activist Samar Badawi. Saudi authorities arrested award-winning gender rights activist Samar Badawi and Nassima al-Sadah last week. They are “the latest victims of an unprecedented government crackdown on the women’s rights movement that began on May 15, 2018 and has resulted in the arrest of more than a dozen activists,” the US-based rights group said. Meanwhile, Amnesty International has called on the global community to join with Canada and call for the release of the female activists. “The international community must push Saudi Arabian authorities to end this draconian crackdown and targeted repression of human rights defenders in the country”, Amnesty International’s Middle East Director of Campaigns Samah Hadid said. “Instead of pursuing human rights reform, the government of Saudi Arabia has chosen to lash out with punitive measures in the face of criticism. States with significant influence in Saudi Arabia – such as the USA, UK and France – have now remained silent for far too long.